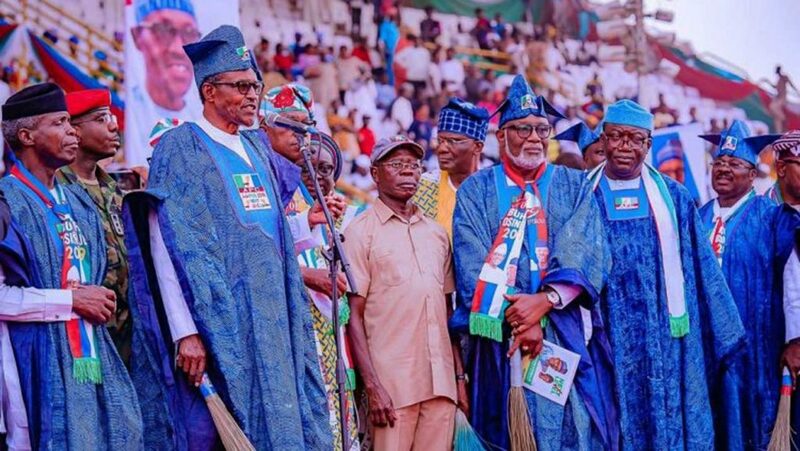 A dress rehearsal of what is likely to happen during the general elections in Ogun State played out yesterday, forcing the presidential rally of the All Progressives Congress (APC) in Abeokuta to be hurriedly brought to an end by the party.During the rally at the MKO Abiola Stadium, some of the aggrieved party supporters who had decamped to the Allied Peoples Movement (APM), hurled items at the state gubernatorial candidate of the APC, Prince Dapo Abiodun, while his hand was being raised by President Muhammadu Buhari. It was an embarrassing moment for Governor Ibikunle Amosun who struggled to calm the APM flag carriers. It took the intervention of the security operatives on the podium to block the items being thrown from hitting the target. To prevent the situation from degenerating, the rally was hurriedly ended. Earlier, when Vice President Yemi Osinbajo said the party faithful should “vote APC in all the elections”, the aggrieved supporters shouted him down, and he abruptly ended his speech. Four days to the elections, the political atmosphere in the state is getting tensed, with rising cases of attacks and electoral violence. At the weekend, the campaign train of Abiodun came under a fresh attack.It was learnt that the campaign train was on its way to Ofada town, shortly after a rally in Owode, Obafemi-Owode Local Government, when the thugs who ambushed it, shot sporadically and hurled stones at the convoy. Sources told The Guardian that the determination of the various parties to dominate in their strongholds was creating an atmosphere of desperation, the reason for the worries that the state may be a hotbed of political violence. On January 13, two rival factions of the Peoples Democratic Party (PDP) unleashed mayhem on each other in Sagamu area with many people wounded and vehicles destroyed. Amosun said: “The other one (governorship race), we will resolve it on March 2. We are respecting President Muhammadu Buhari. Don’t transfer your anger to APC. I have told you that you we will all be one by March 3 and you will come back to APC. You know what to do when it is March 2, but honour me on February (presidential election day) 16 and vote for Buhari. Akinlade whose party (APM’s) gubernatorial candidate, Adeunle Abdul has pledged to vote for Buhari was part of the crowd. Amosun, though still an APC member is sponsoring Akinlade against Abiodun in the Governorship race. 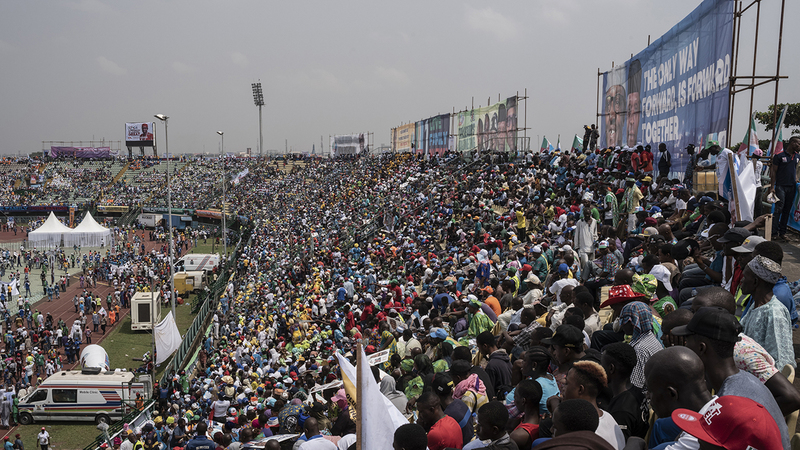 Many APC supporters who were waiting for Buhari to tell all APC members that they should vote for their candidate in the March 2 election were disappointed as the president after raising Abiodun’s hands, told them to vote for whoever they prefer.The fracas which occurred outside the stadium in the morning, resulted in injuries to people who were struggling to get inside. At a point, the police had to use teargas to disperse the people but it rather fueled the violence as a result of which many people had to leave before the arrival of Buhari and his team at 3:00 p.m. According to the party: “The people of Ogun state, and indeed, the South West, have shown that they are in direct alignment with other states and geo-political zones of our country in rejecting President Buhari and Vice President Yemi Osinbajo, whose administration has foisted so much injustice and brought unprecedented pain and anguish to Nigerians. Represented by Nigeria’s Ambassador to the Republic of Congo, Deborah Iliya, Buhari described those who sponsor election violence as unpatriotic. He advised the citizens to shun political thuggery and other criminal acts. Meanwhile, the PDP presidential candidate, Atiku Abubakar, has accused Buhari of instigating violence ahead of Saturday’s general elections. Atiku, while addressing PDP supporters during his campaign at the Adokiye Amisenaka Stadium in Port Harcourt, Rivers State yesterday, accused the president of inciting people while campaigning in Zamfara State on Sunday to be prepared to make trouble. Atiku said it was not the first time the president would be preaching violence. He regretted that 12 years after he left office as vice president, the dualisation of the East-West Road started by the Olusegun Obasanjo administration has not been completed because Buhari’s government has neglected it. He said if elected, he would complete the project. He also promised to revive all the seaports which are in comatose in the Niger Delta. Atiku promised not interfere with the National Assembly and judiciary because these two arms of government are critical to ensuring checks and balances to avoid a slide to dictatorship.He pledged to restructure Nigeria to meet the expectations of those who are agitating for restructuring. Also speaking, former President Goodluck Jonathan observed that since May 2015 till date, a lot has happened in Nigeria that should spur the people to decide whether to continue on the part of retrogression into which the Buhari’s administration has allegedly plunged the country or to opt for progress, which Atiku represents. “All the indices of development, be it unemployment, poverty, health, everything that is measured, none of these areas have we made any progress. I believe that you all know that we cannot as a nation continue to stay where we are, “ he said. Jonathan said the PDP presidential candidate did not have nepotistic tendencies as he would ensure that anyone who is qualified for a position would be appointed irrespective of whichever part of Nigeria he or she hails from. Rivers State Governor Nyesom Wike said “this week’s election is between two options, dictatorship and darkness which the APC represents and light and freedom which PDP symbolises.”Sokoto State Governor Aminu Tambuwal said it had become obvious that Buhari was not in charge of the affairs of Nigeria, hence he should be voted out this week to usher Nigeria back on the part of progress. PDP national chairman, Uche Secondus, described the APC as a party in disarray, hence not fit to continue in power. He said the desperation to cling on to power at all costs spurred Kaduna State Governor El-Rufai to issue treat to foreigners. According to him, that treat could only be likened to the language of a terrorist.